Hosted by local artist Andrea Fergusson. We invite you to come and create art over cocktails at Jamie’s Rainforest Inn. Grab your friends and spend two hours drinking, laughing, and flexing your creative muscles. There’s no experience necessary and all supplies are provided, so you don’t have to worry about a thing (except having a great time!). The event begins promptly at 7pm. Please allow extra time to find parking and get settled. If you’re coming with a group (yay, how fun!) make sure you arrive early to get seats together. 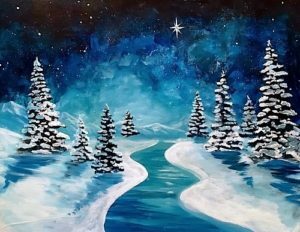 If you’re planning to eat dinner before the event, please inform the host/hostess that you’re with Paint Nite® and check in with us to reserve your seats.